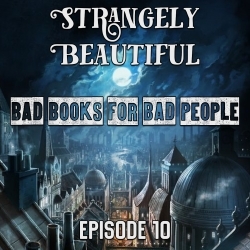 Bad Books for Bad People: Episode 10: Strangely Beautiful - A Nice Book for Nice People? Author Leanna Renee Hieber has created an alternative Victorian London that merges ghost-hunting, Jack the Ripper, capital-R Romantic love, and a healthy dose of post-Harry-Potter magic in her novel Strangely Beautiful. Originally published as two books in 2009 and 2010, Hieber's story features a beautiful, innocent young woman raised in a convent and dropped into a supernatural battle that will change the course of her life. The author describes this book as "Victorian Ghostbusters" and seeks to create a new brand of Gothic with a modern sensibility within its pages. How will Jack and Kate react to this fanciful new spin on tried-and-true suspense tropes? Why does Kate loathe the male lead more than any other character from any other book they've read so far? When does a wish-fulfillment fantasy for a teenager become a horror story for a middle aged person? And how do Jesus, Snape, and Ilsa, She Wolf of the SS figure into all of this? Find out all this and more in this month's episode of Bad Books for Bad People.